The artist [1834-1917], Paris; bequest to his heirs; reportedly given to the Hébrard family, Paris, by Jeanne Fevre; Nelly Hébrard [1904-1985], Paris, by 1955; (M. Knoedler & Company, Inc., New York), by 1956; sold 1958 to Paul Mellon, Upperville, Virginia; bequest 1999 to NGA. The artist's heirs were René De Gas, his last surviving brother, who lived in Paris, and the four (of eight) surviving children of his sister Marguerite, who had died in Argentina in 1895. (His other deceased sister Thérèse left no descendants.) Marguerite's surviving children were: Marie-Fanny-Augustine-Jeanne Fevre, unmarried; Pauline-Marie-Madeleine Fevre, a Carmelite nun; Henri-Jean-Auguste-Marie Fevre, an industrialist who lived in Marseille; and Gabriel-Edgar-Eugène Fevre, an agent in Montevideo, Uruguay. See Anne Pingeot and Frank Horvat, Degas sculptures, Paris, 1991, and Anne Pingeot, "The casting of Degas' sculptures: Completing the story," Apollo (August 1995): 60-63. 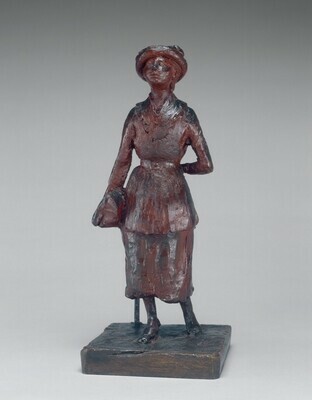 Nelly Hébrard, letter reportedly dated early 1955 to an unknown recipient (possibly M. Knoedler & Company, Inc.), cited by Patricia Failing, "The Degas Bronzes Degas Never Knew," ARTnews 78, no. 4 (April 1979): 41. Nelly Hébrard, letter dated 22 December 1955, to an unnamed "Monsieur" (probably Ludwig Charell, acting on behalf of Knoedler in Paris), in NGA Gallery Archives, RG2, Series 2C1, File: 1940-1955. John Rewald, Degas Sculpture: The Complete Work, trans. John Colemn and Noel Moulton, New York, 1956: 158. Possibly Edgar Degas 1834-1917: Original Wax Sculptures, M. Knoedler & Company, Inc., New York, 1955, not in cat. Pingeot, Anne. Degas Sculptures. Paris, 1991: no. 74. Campbell, Sara. "A Catalogue of Degas' Bronzes." Apollo 142 (August 1995): 10-48, 48, fig. 72. Lindsay, Suzanne Glover, Daphne S. Barbour, and Shelley G. Sturman. Edgar Degas Sculpture. The Collections of the National Gallery of Art Systematic Catalogue. Washington, D.C., 2010: no. 57, 322-327, color repro.